I’ve recently started getting 4 figure daily page views which is incredible. I’m absolutely ecstatic - not so long ago, 100 a day was an achievement and now to be averaging over 2000?? The hard work definitely pays off! There is one reason for this. Pinterest. It is my single biggest source of traffic. I had a pin go semi-viral on there (a few thousand repins) and it just keeps driving traffic to my blog, as well as some other pins from my website contributing to my higher page views. 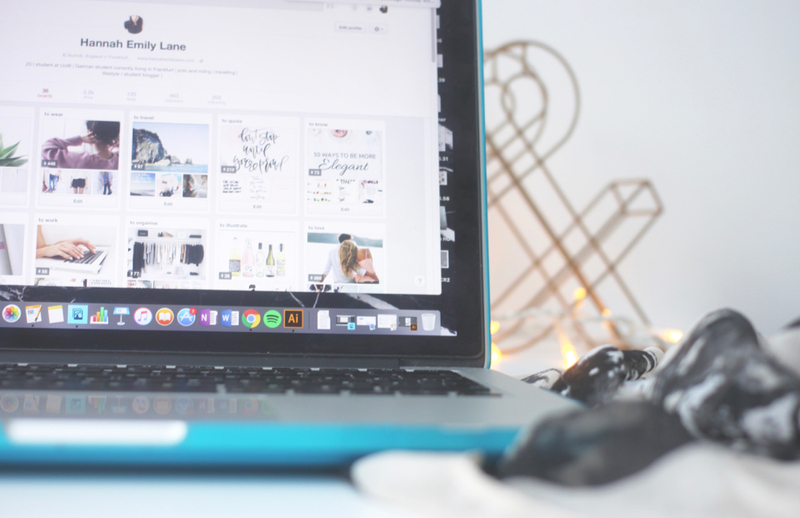 Every blogger should be utilising Pinterest if they want to start growing their blog. In this guide, I’ll tell you everything you need to know to get started with sharing your blog content on there and directing traffic your way. Pinterest is less like a social media platform, and more like a visual search engine. The concept of it is to save (or pin) images to boards. It’s used to save helpful articles, inspiration, recipes, DIYs, literally anything. A pin is like a bookmark, so you save it to a board, maybe for later reference and then you can click on the pin to go to the source. Though there is the opportunity to interact through commenting and messaging, this isn’t the main focus of Pinterest. There’s hardly any interaction? Why should I use Pinterest then? There’s not much direct, social interaction, but there’s so much sharing going on. Nearly 80% of pins on there are repins, which is similar to a retweet. In contrast, less than 2% of tweets are retweets. This is obviously advantageous, and carries the opportunity for something to be shared thousands and thousands of times, every time reaching a new audience with new followers. As an example, if someone pins an image from my blog to one of their boards, all of their followers will see this in their feed. If just one of those followers likes the looks of it and pins it to their own boards, a whole new group of followers will see it. You can see where this goes. Despite the fact the feed is chronologically ordered, pins have a much, much longer lifespan than a tweet for example. Think hours on Twitter, months on Pinterest. A lot of people search for their interests on Pinterest, which means a pin from YOUR blog could be shown. Or it could be shown in ‘Related pins’, which appear below a pin when you click on it. Pinterest is such a growing platform. It’s definitely worth getting yourself on there. Even if you don't use it for your blog, it's great for inspiration for any project you're thinking of, in general, or just to waste hours of your life scrolling through drool-worthy decor or pictures of mouth-watering food. OK so I signed up, now what? Pin away! Make some boards that interest you such as a fashion inspiration one, a beauty tips one, one of cute dogs, recipes you want to try, quotes that inspire you - search for these topics and add pins. Find a board that you love? Follow it. Link your Pinterest on your other social media so people know you’re on there. Follow people with similar interests as you. Rather than searching for pins, search for boards instead so you can find even more pins and people to follow. Explore. The more you pin, the more likely people will follow you as it shows you’re active. I’m not going to lie, I find Pinterest the hardest platform to grow followers on, but try to build up a little following by sharing your profile on your other social media, following and repinning from others, and joining group boards (more on this in a bit). Make sure you’ve written a little something in your bio and uploaded a profile picture. I like to follow humans, not pictures of a pin. I relate more to humans. They seem more real. Put your favourite/popular boards at the top of your profile so people will see these first. Have attractive cover photos which reflect the board’s content. How do I use Pinterest to build traffic to my blog? I think the trick to Pinterest, like any social media platform is not to use it for the sole purpose of promoting. If you ONLY pin pictures from your blog then you probably won’t benefit too much. There should definitely be a mix. If you plan on pinning blog posts, you should have a board dedicated to your blog. Once you’ve published a blog post, you can pin it to this board. Then, you will probably work out your own strategy and what works for you over time, but what I tend to do is repin it to other relevant boards over the course of a few days (there’s little point pinning it to all boards all at once in my opinion, as it will just be repetitive on someone’s feed - you want to spread it out). Think like Twitter: you wouldn’t tweet a promo tweet multiple times in the space of a few minutes. Works the same way. Group boards are great. Find group boards. Join group boards. Pin to group boards. A group board is basically a board where there are multiple contributors, any of which can pin to it. The hardest thing about group boards is finding them. There's a few ways to do this. You can either search on Pinterest and limit your results to boards to find one, look at the people you’re following and see if they’re in any of interest to you, and there are also websites with lists (try searching group boards on Pinterest and have a look at the multiple pins on this). I tend to just stumble across them (I don’t know, kind of like how you stumble across really weird Youtube videos after you’ve fallen in that bottomless hole). Pinning to these boards can expose your content to a wider audience, so it’s definitely worthwhile! Don’t overdo the group boards though, just pick a very select handful to join in with. So I’ve talked about where and when to pin your images, but I haven’t yet mentioned which images to pin. Again, this is where it’s different to other social media. If you want to start sharing your blog posts on Pinterest, you should include Pinterest-specific images in your blog post. Some images just do better than others on there, get repinned more times, get noticed more often - this is what you want. A image on Pinterest should always be vertical/tall/portrait - whatever you want to call it. It should be bright coloured, it should have some easy to read text on it to draw attention in. I think the best way to work out what does well on Pinterest is familiarise yourself to it. What do you find yourself repinning? Why? What do these pins have in common? 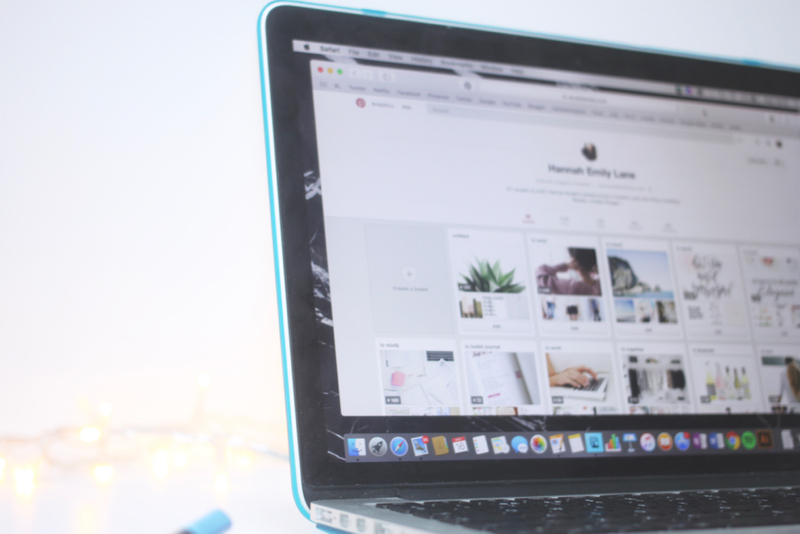 While I think Pinterest is great for driving traffic and potential new followers to your blog, perhaps more so than Twitter, it doesn't offer the same level of engagement. You can't easily start a conversation on there. I think using Twitter and Pinterest in conjunction works well - you can engage with your readers and build relationships on Twitter, and you can get your posts seen on Pinterest. I hope you found this guide helpful. If you have any more questions or requests please let me know in the comments or over email and I'll do my best to help you out! What's your opinion on Pinterest? Do you use it often? P.S you can follow my Pinterest here!